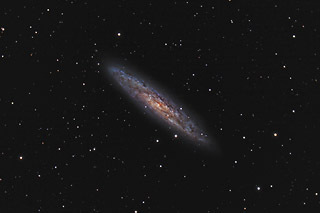 NGC 253 is the largest galaxy in the Sculptor group of galaxies. Visually, the galaxy is quite large - about 28' x 6'. This is the width of the full moon (although much fainter and thinner!). 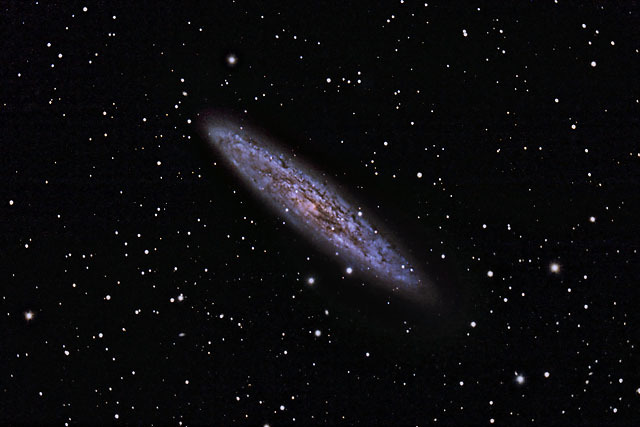 At magnitude 8, it is a fairly easy object to see in a telescope, although it is always quite low for us in the Northern Hemisphere. Software Used Images Plus 4.0 for camera control, calibration, stacking and digital development. Photoshop CS5 used for flat fielding , curves, color Correction and saturation adjustments, star shrinking, and high pass filter. HLVG for additional color correction, Carboni Actions for additional saturation adjustments. Notes This was a difficult object to photograph because it never rises above 30 degrees at my latitude. I think the final result came out rather well. I have some Hydrogen Alpha data to add to this when time permits. This image was chosen Digital Astro Challenge Photo 1st place for September 2011 in the Galaxy Category. I subsequently reprocessed this image to be much improved. The reprocessed version is HERE.